I use Grammarly’s plagiarism checker because it works! Have you tried it? 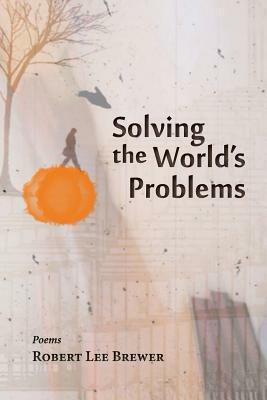 Solving the World’s Problems by Robert Lee Brewer is the debut collection of a poet who has spurred inspiration virtually for many years as part of the Writer’s Digest team, and as a debut, it oozes deconstruction, construction, and reflection in each poem’s white spaces in ways that are thought-provoking and eye-opening. There are love poems, break-up poems, and get back together poems, but the overwhelming theme seems to be that love is the great connector of us all — no matter how successful the relationships ultimately are — and the poet seems to postulate that love can “solve the world’s problems.” While some of these poems have a pessimistic hint in them, they are balanced with a certain amount of light. But there are more serious moments, moments in which social issues are addressed, such as global warming in “one day we looked for the snow” (page 49) and living in a fast-paced modern world where appearances matter and wars are inevitable — “why I never mention the traffic report” (page 52). But more interestingly, there is an exploration of the modern world and the perceived increase in connection between humans, but the reality is that we seek these outlets to distance ourselves from one another — walking out the door has never been easier when face-to-face takes a back seat. 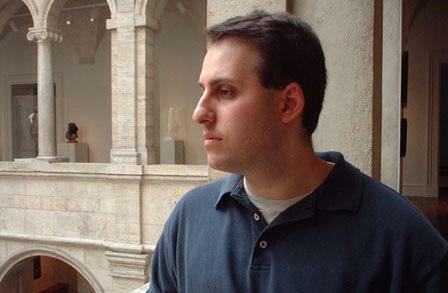 Robert Lee Brewer is Senior Content Editor for the Writer’s Digest Writing Community. He edits books, manages websites, creates electronic newsletters, crafts blog posts, writes magazine articles, participates in online education, and speaks nationally on writing and publishing topics. As a poet, Robert was named Poet Laureate of the Blogosphere in 2010, has been a featured reader at several poetry events around the country, and is the author of Solving the World’s Problems (Press 53). Follow him on Twitter @robertleebrewer. 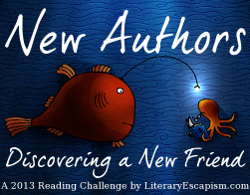 This is my 63rd book for the 2013 New Authors Challenge. This is my 26th book for the Dive Into Poetry Challenge 2013. Black Aperture by Matt Rasmussen, 2012 winner of the Walt Whitman Award from the Academy of American Poets and recently added to the National Book Award 2013 long list, could not be more aptly named. The light passing through this dark hole is that of the narrator’s brother when he commits suicide, forever changing his family and yet changing nothing in the wider world. There is a balance Rasmussen tries to strike here between the irrevocable change the family, and in particular the brother, feel and the lack of change outside of their microcosm, even in nature where the hunters and sportsman arbitrarily continue to shoot clay pigeons or deer. There is a deep sadness in these poems, but also a sense of confusion and desire to understand, even when understanding is beyond our capacity because we are not those who have taken their lives. We have different experiences and different perspectives, and while we have the capacity for empathy, that is oftentimes not the same — or enough. 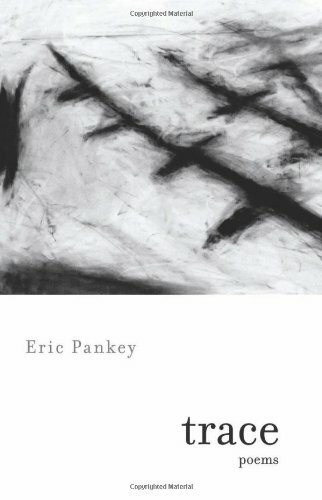 The narrator of the poems even acknowledges this when he says in “Elegy in X Parts,” “There is no refuge//from yourself.” (page 36) It is because we are trapped with ourselves that suicide may seem like the only solution, especially if we are unable to see solutions outside of ourselves. Rasmussen has some stark images, haunting pictures of death and lifelessness. There is an emptiness in those vivid moments, which the poet captures with so few brushstrokes. As the past slips further away, people and moments fade, but their impressions are still felt — as personified by “Monet as a Verb” (page 19). And although a tragic loss can be scarring, scars fade and heal. 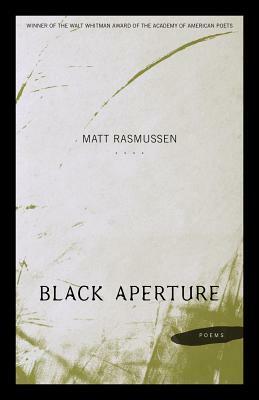 Black Aperture by Matt Rasmussen examines the light that leaves our lives in a flash, often unexpectedly and without reason, and how we sometimes grieve for long periods of time afterward and in some cases, even want to follow our loved ones through the same dark hole to find peace, understanding and closure. This is my 25th book for the Dive Into Poetry Challenge 2013. This is my 59th book for the 2013 New Authors Challenge. 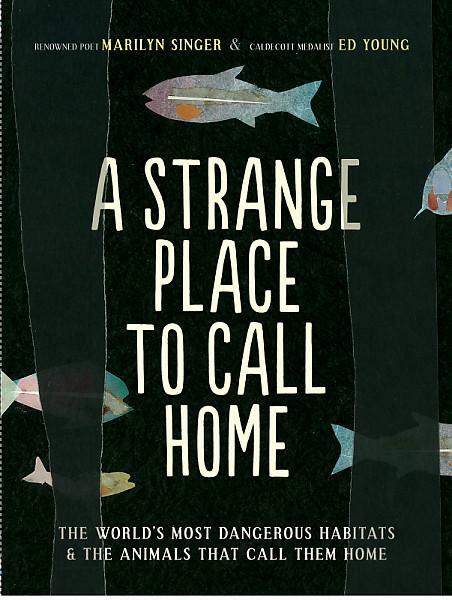 A Strange Place to Call Home by Marilyn Singer, illustrated Ed Young, is a collection of poems and illustrations about animals that live in harsh environments and have adapted to their conditions. 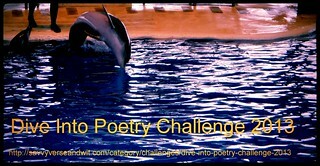 The poetry forms include free verse, cinquain, haiku, villanelle, sonnet, and others that give young readers a brief look at the animals in their habitats from the Humboldt penguins that live in the warmer climates of Chile and Peru to the blind cave fish that live in the dark deep. Included in the poetry book are at times abstract looking pictures of the animals or their habitats, though the images resemble collage techniques that incorporate various mediums. The book also includes a break down of what poems exemplify which form and end notes that give a little more information about each animal. For my little girl, who is age 2, this book was a little too old for her. She couldn’t pay attention long enough to get through the entire book, but she loved the pages with the snow monkeys in “Think Heat.” There are a lot more questions than answers, and kids who are older are likely to want more information about each animal and habitat. For younger kids, there’s just enough in each poem to mirror their own wonder, including them in the wider questioning of these animals’ lives. A Strange Place to Call Home by Marilyn Singer, illustrated Ed Young, is a little too old for my little one, but if she retains her love of animals, she’ll likely enjoy this more as she gets older. I found the poems a little too simple, and some did not have enough information about the animals or their habitats, but the end notes did offer a bit more information. As a jumping off point, the book will spark questions from younger readers, and it could inspire a mother- or father-child exploration of these harsh habitats and adaptable animals. Singer offers a special thanks at the beginning of the book to several people and museums, which seems to be where she obtained some of the information for her poems. Marilyn Singer was born in the Bronx (New York City) and lived most of her early life in N. Massapequa (Long Island), NY. She attended Queens College, City University of New York, and for her junior year, Reading University, England. She holds a B.A. in English from Queens and an M.A. in Communications from New York University. Visit her Website. Caldecott Medalist Ed Young is the illustrator of over eighty books for children, seventeen of which he has also written. He finds inspiration for his work in the philosophy of Chinese painting. Young began his career as a commercial artist in advertising and found himself looking for something more expansive, expressive, and timeless. He discovered all this, and more, in children’s books. Visit his Website. This is my 38th book for the 2013 New Authors Challenge. This is my 24th book for the Dive Into Poetry Challenge 2013. 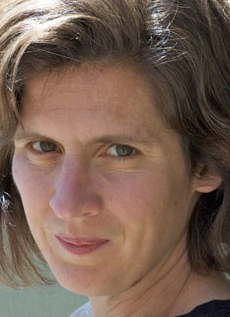 Kirkpatrick wonders about the connections between humans and nature, particularly animals. She postulates in “At the Turkey Farm” whether we absorb the loneliness and longing of turkeys when we eat them during holidays, but at the same time she talks about their only solace as being able to stand in the fading light in their own poop. At the heart of the poem, the narrator is exploring the existence of these animals as walking corpses and ghosts haunting the farms but not really living. In a way the poem itself is haunting, forcing readers to contemplate these farms where animals are bred to be something other than themselves, serving mostly as food. on the other side of a human eye? to men I didn’t know. to make a world we’d be losing fast. I saw why it was lost. And I saw how we would lose it. In some poems, Kirkpatrick weaves in the teachings of Buddhism, but in some instances, those teachings cannot stop the suffering. “After Zazen” explores the many forms of suffering facing humanity, including accidental swallowing of stones to cause near suffocation and death and the invasion of one country into another. Raising questions about suffering on many fronts, the narrators are searching for ways to end it or at least ease the pain. Meditation may not be the best solution or it could be. Beyond these moments of suffering, the narrator blur the lines between animal and human to find the similarities of feelings and behaviors, but to also outline the loyalties that have been forgotten, like that of a dog and master. Perhaps that loyalty should be expanded to include other aspects of nature. 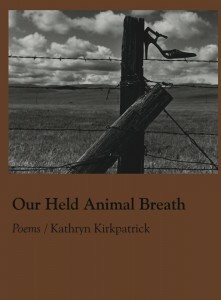 Our Held Animal Breath by Kathryn Kirkpatrick offers a wide range of poems for discussion in book clubs, focused on the impact of human activity on the environment and the changes that are possible if we just think outside the box. What are the ways that we can brainstorm to feed ourselves and continue to live and grow without harming other animals and nature. While the brown of the cover is a bit off-putting; the shoe seems out of place on the wire fence, though that may be on purpose given the sometimes out of place nature of our own existence in the world. Raised in the nomadic subculture of the U.S. military, Kathryn Kirkpatrick was born in Columbia, South Carolina, and grew up in the Phillipines, Germany, Texas and the Carolinas. 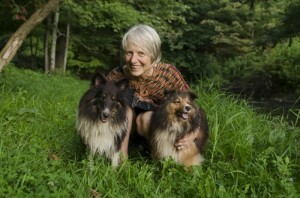 Today she lives with her husband, Will, and their two shelties in the Blue Ridge Mountains of North Carolina, and she currently holds a dual appointment at Appalachian State University as a Professor in the English Department and the Sustainable Development Program. She has a Ph.D. in Interdisciplinary Studies from Emory University, where she received an Academy of American Poets poetry prize. This is my 23rd book for the Dive Into Poetry Challenge 2013. This is my 35th book for the 2013 New Authors Challenge. Miss Plastique by Lynn Levin reminded me of the comic book character Plastique in that many of the female narrators in this collection are very explosive. And the cover of this collection is very ironic, with the sweet looking Barbie doll decked out in a corset-like shirt and chain necklaces, giving a hint of her edginess. In one of the first poems, “Miss Plastique,” Levin references the explosive nature of C-4 and how it must be handled with care, much like the narrator. Levin examines the notion of judging a book by its cover, and how something that doesn’t look dangerous can be exactly that. Some poems have a bit of tongue-in-cheek humor, like in “The Foundations of Poetry,” the narrator recounts some advice from an English teacher long ago, “‘You should expose/your thoughts and feelings/when you write poems,’ taught Mrs. Hay./’In verse, a little thigh is fine/and you may dream your truth into your lines./Only do not lie to yourself.’//” (page 16) These poems contain material that can be explosive if not handled with care, but in Levin’s hands the tension in the poem is sometimes just enough to sustain it without a bomb going off, but in other poems, there is just no other way to express the emotion that has been building. Levin has a gift in that she knows precisely when to change the mood in the poem, turning the tables on the reader, who thinks there is a love sonnet but realizes soon enough that the object of the poem is no longer a love interest but someone who has spurned the narrator. In the latter section of the book, Lilith appears — a long used symbol of rebellion for feminists — and she alongside Eve stands tall and ready to act, rather than simper and wait for things to change. Miss Plastique by Lynn Levin is about taking charge, being a force to be reckoned with, and standing tall in the face of adversity — whether its a mundane as a dilemma as choosing the best outfit or as dire as escaping a violent relationship. But there are moments of vulnerability in these poems as well as explosions. These poems will make sure readers are kept on their toes. This is my 22nd book for the Dive Into Poetry Challenge 2013. Unexplained Fevers by Jeannine Hall Gailey builds on the poet’s exploration of popular myths and legends centered on women, only unlike Becoming the Villainess (my review) where the characters become vengeful, these characters are striking out for parts unknown, examining their legends, and telling the real tales behind the fairy magic. From Jack and Jill who vowed to stay together against all odds who find themselves in Ohio to Alice in Wonderland who merely gets lost in a coat closet, Gailey is poking fun at the fantasies that rely on women being beautiful and little else to prove their worth. These heroines are set free, and outside the confines of their tales, they are able to contemplate their past choices and their futures in ways they never though possible. choked down broken promises like apple. In looking at these tales, Gailey is not only calling into question their validity but also their impact on the generations that have read them. Are women supposed to be only beautiful and only want that prince to come rescue them? And by the end of the collection, the poet asks readers to think about how much has changed even in the modern world. May be there are few princes with castles and white steeds, but don’t they have other “enticements” like good paying jobs and the house in the suburbs that women continue to gravitate towards as safe and what they should want from their lives? Like “Alice, Through the Looking Glass,” there are poems that are more universal and do not stick as closely to the stories as some other poems do, and in these poems, Gailey raises questions about body image and the prevalence of women in advertising to not only sell products, but also to sell an idea of what beauty is and should be for every woman. The narrator in “Alice” asks, “What am I doing here in this white room/with no smell but dust and soap//” Meanwhile, Snow White asks the reader in “I Like the Quiet: Snow White” to get her out of our own looking glasses — break free from the need for a certain appearance — readers would see their true selves and who each of us really is and how we matter without the constant need to live up to a beauty standard. Snow White is just like all of us, wanting to spend time alone, wanting space to decide the course of our lives, wanting not to rush into a marriage even with a prince, and all the trappings and decisions we make in our lives. Unexplained Fevers by Jeannine Hall Gailey easily parallels the myths and stories we’ve read and memorized as children with the current modern lives we lead. Though lest you think all of the poem narrators are female, there are male narrators, including one knight who did not get the fairytale ending he was expecting. In this way, Gailey is calling into question the fantasies that men are fed as children as well; must they be rescuers and be the strongest and bravest to get the girl? A phenomenal collection from beginning to end — one that has a permanent place in my library, right next to her others. This is my 19th book for the Dive Into Poetry Challenge 2013. 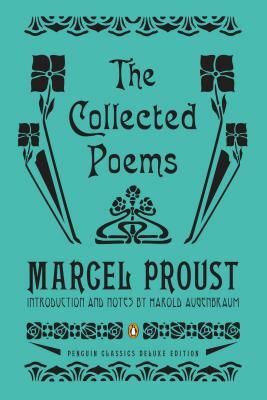 The Collected Poems of Marcel Proust edited by Harold Augenbraum includes not only the original French alongside the English translations of the poems, but also detailed notes on the various references and historical context for each of the poems at the end of the collection. As an interesting addition, there are a few of the original drawings that Proust sent along with the poems in his correspondence. Proust is generally known for his prose, and most people don’t know that he wrote poems. (While I’ve read some of his poems before, I have not read his prose. I’m a bit out of the norm.) “The poems were composed from when Proust was seventeen to when he was fifty,” says the introduction on page xvi. That’s a long period of time, and there are a great many poems. How many of these poems were written down in one moment or revised is unclear, but some of these poems clearly were further along in the process. Proust’s poems range from witty to plainspoken and sarcastic. Some of his poems about love border on the edge of passion and hatred, and there are moments in certain poems that may remind readers of the great Romantic poet Percy Bysshe Shelley. Proust’s poems celebrate not only art, but also music, language, and friendship — even those relationships that sour. Many of these poems were untitled. Like bright chandeliers on the ceiling of my mind. His poems are playful and cutting at the same time, and his grasp of language and all its capabilities is astounding. Readers will wonder about the subjects that are not clearly named, but at the same imagine their own obsession or loved one in their stead. Even without knowing the subject of poem 9, the reader can gather that the woman once held an esteemed place in the poet’s heart, but has now fallen into disgrace in his eyes. And yet, even though the love affair has gone downhill, she still is remembered fondly but will remain in the past. From the traditional forms of sonnet to the less-than-traditional prose-like poetry in the collection, readers will get a sense of Proust’s evolution as a writer and his experiences as he saw them. The Collected Poems of Marcel Proust edited by Harold Augenbraum has a lot to offer readers, and while it is not necessary to read the French, those who can will have a richer experience. Valentin Louis Georges Eugène Marcel Proust was a French novelist, critic, and essayist best known for his monumental novel In Search of Lost Time. It was published in seven parts between 1913 and 1927. This is my 18th book for the Dive Into Poetry Challenge 2013. This is my 29th book for the 2013 New Authors Challenge. Today marks the end of National Poetry Month, and I hope that you found some great poets and poetry collections to try this month. I’m especially pleased that we had so many participants for the Friday activities. See all of you next year for another blog tour of poetry, but I hope you’ll stick around for the rest of this year too. If you missed some of the posts this month, just click here and scroll through. The action of the poems in Thievery by Seth Abramson, published by the University of Akron Press, occur in between the silences and the pauses of each line break and each trick phrase, highlighting the theft of what has been stolen. From the innocence of our children to the rallying of small towns around their own even when the most horrifying things occur. 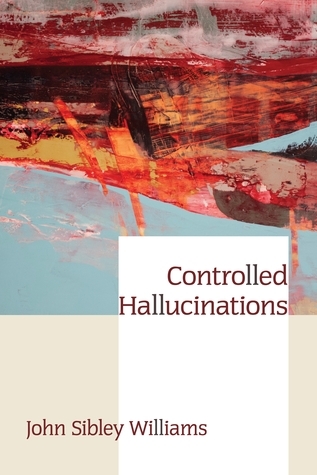 Abramson performs a sleight of hand in his poems, changing their trajectory at a moment’s notice, calling attention to the illusions that are around us everyday. I wear the road. Within my skin it is bad. in something like it, is it time now. Does the time come. Does it ever. but me I go all the way. Thievery by Seth Abramson is subtle, and at times too much so, in its exploration of change throughout society and within individuals as it asks readers and others when is the time to stand up and to create change for a better world. When is the time for us to stop the thieving from others and ourselves? These are questions that should be asked and should be met with action. Seth Abramson is the author of The Suburban Ecstasies (Ghost Road Press, 2009). In 2008 he was awarded the J. Howard and Barbara M.J. Wood Prize by Poetry. A former public defender, he currently attends the Iowa Writers’ Workshop. Please check out his blog. 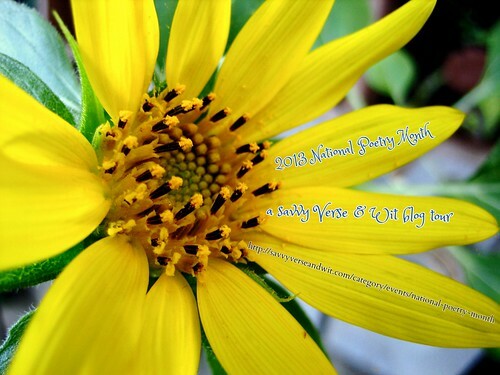 Please click the image below for the latest tour stop on the National Poetry Month Blog Tour! This is my 17th book for the Dive Into Poetry Challenge 2013. This is my 26th book for the 2013 New Authors Challenge.